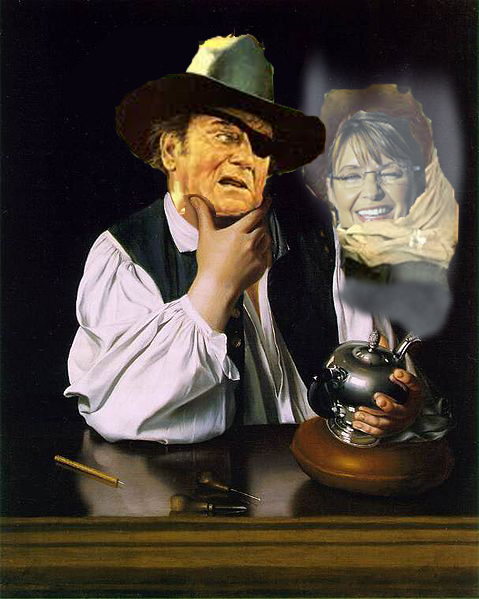 Is Paul Revere really a ‘gotcha question?’ Sarah Palin thinks so, and so do her fans. Apparently, they rushed to her defense quickly by trying to validate her historical accuracy misstep, and thereby making her seem more accurate, through a concert of editing George Orwell’s Winston Smith would have been proud of. Palin’s history says that Revere himself was “riding his horse through town to send those warning shots and bells.” Never mind that it would have been physically impossible for a man on horseback in the mid-18th century to ring a bell with one hand while continually loading and firing his musket with the other. Even Rooster Cogburn (from True Grit) would have had a tough time pulling that feat. Even if he did, it’s kind of difficult to yell, “The British are coming,” with reins clenched between your teeth. According to Charles Johnson, on his Little Green Footballs blog, Sarah Palin’s supporters have been “trying like crazy to edit the Wikipedia page for ‘Paul Revere’ to make it match Palin’s botched version of history,” over the last few days. The Paul Revere House a historical museum in Boston officially summarizes the revolutionary ride thusly On the evening of April 18 1775 Paul Revere was sent for by Doctor Joseph Warren and instructed to ride to Lexington Massachusetts to warn Samuel Adams and John Hancock that British troops were marching to arrest them On the way to Lexington Revere alarmed the country-side stopping at each house and arrived in Lexington about midnight. However historian Nina Zannieri the director of the Paul Revere House told us that there are grains of truth dispersed here and there in the former Alaskan governors account which she may have picked up during her recent visit to Bostons Old North Church..